I will admit it: I love office supplies. I always have. Paper, pens, notebooks, folders ... you name it. Point me in the direction of an office supply store, and I am happy. I am a big fan of Post-It Notes. I use them daily, on inventory cards with work, and also (in smaller format) flagging book pages for reviews. Post-It Notes started with an accident. A scientist with 3M, Dr. Spencer Silver, was trying to make super-strong adhesive. By accident he ended up with a pressure sensitive adhesive. A colleague tried the adhesive paper to mark his place in a church hymnal ... and the product was on its way! The early Post-Its were all yellow because that was the color scrap paper available for experimental production. Post-Its were marked as Press 'n' Peel in 1977. 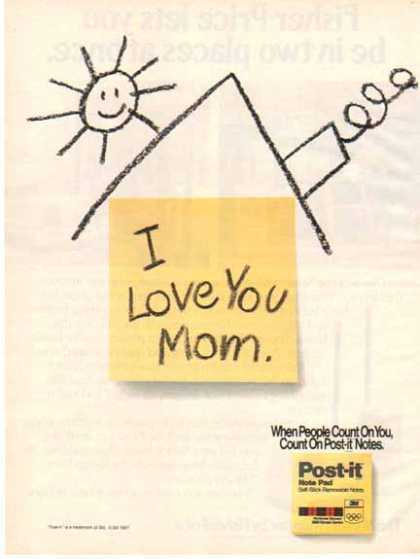 The product did not take off until it was re-marketed as Post-It Notes in 1980. You'll find an early product ad above. Post-It Notes have always been recyclable. It would take 506,880,000 Post-It Notes to circle the earth. The lead characters in Romy and Michelle's High School Reunion claim to have invented Post-It Notes. So there you have it! Any other office supply fans out there? (This love of all things paper extends to stationery, art supplies, and office supplies with me.) I'd love to hear from you in the comments, below. This is so funny, because we just used post-it notes in a meeting this morning, and were talking about them. They are the best! I definitely agree! Post Its are soo useful. They can be everywhere at once and makes you feel so productive. I immediately thought of Romy and Michelle, ha. Love that movie. Thanks for sharing the facts about Post-It notes. I had no idea about the history even though I am a huge fan. I need them in all sizes! Thanks so much for stopping by - I enjoyed reading your comments!